Tired of that typical crudité platter you see at every party? 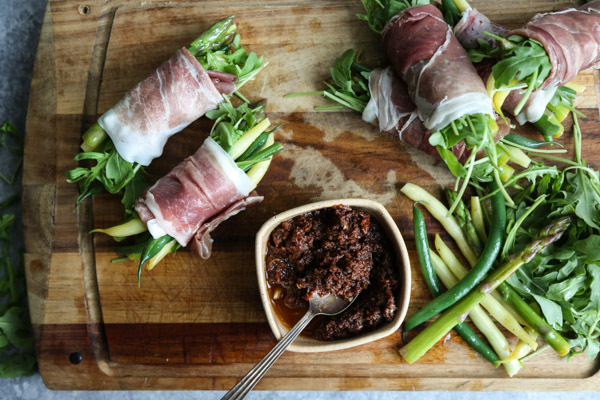 Prosciutto wrapped asparagus with green beans and arugula is the new way to go, and taken to a whole new level served with homemade sundried tomato pesto. Eating vegetables can be made more interesting, and obviously more delicious, by serving prosciutto wrapped asparagus with a pesto dipping sauce for a fresh, savory tasting profile. Serve this healthy-ish appetizer from blogger Phoebe Lapine of Feed Me Phoebe with (what else?) but a glass of Prosecco to officially get the party started. Transfer the contents of the sun-dried tomato jar (olive oil and all) into a small food processor. Add the garlic and chili flakes. Puree until smooth, adding more olive oil if necessary, until the tomato mixture is the texture of a very thick pesto. Taste for seasoning and add more salt if needed. Transfer to a serving bowl or an airtight container. The pesto can be made up to a week in advance. Bring a large pot of water to boil. Once bubbling, add a generous tablespoon of salt. Blanch the asparagus and green beans until vibrant in color but still quite firm, about 2 minutes. Drain in a colander and transfer immediately to a large bowl of ice water. When the veggies have cooled to room temperature, drain again and pat dry with a dish towel. On a rimmed baking sheet, season the dried asparagus and green beans with salt and pepper, and toss with the olive oil and lemon juice. On a clean work surface, lay a piece of Prosciutto di Parma flat. Depending on the size of your asparagus and beans, fold the piece in half widthwise so that the width is smaller than your stalks. On the thicker end, place a small handful of arugula and top it with 4 to 5 veggie pieces. Roll the prosciutto tightly. Repeat with the remaining meat and veggies. Serve the twigs in a blanket immediately with the sundried tomato pesto on the side for dipping.